Prior to joining the ELN, Julia was a research assistant with the German Institute for International and Security Affairs (SWP) in Berlin until 2018 and a project assistant in the organisational team of the Munich Security Conference (MSC) until 2017. 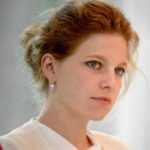 Previously, she worked for the Heinrich Böll Foundation offices in Berlin and Brussels, the German Institute for Global and Area Studies (GIGA) and at the Institute of Educational Sciences at the University of the Federal Armed Forces in Hamburg. Julia holds a Bachelor in Political and Communication Sciences from the Ludwig-Maximilians-University in Munich and the University of Vienna, and completed her Master in Political Science at the University of Hamburg in 2016. Her thesis was a scenario analysis on the future number of nuclear weapon states. She is a Vice-chair of the YGLN and a member of the Réseau Nucléaire et Stratégie – Nouvelle Génération (RNS-NG, promo 2017/18). Julia served as a member of the German board of the International Campaign to Abolish Nuclear Weapons (ICAN) until 2016. Her research areas include nuclear disarmament, non-proliferation, arms control and NATO.